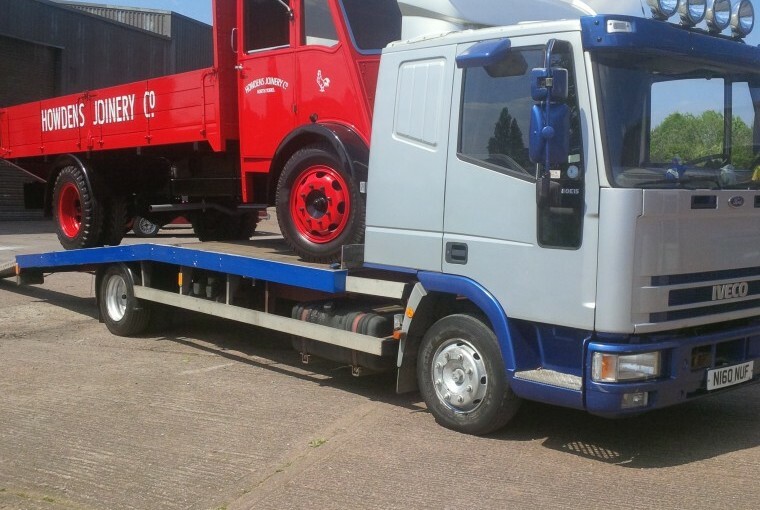 You may have seen our previous post about the full restoration of a Guy Motors Ltd 1948 Vixen 4 Tonne drop side lorry, if not it can be read here. Following us completing the work back in February the new owners ‘Howdens’ were going top use the vehicle as a promotional tool by displaying at a number of classic shows around the country over the summer months and due to the high level of service and attention to detail we showed them during the restoration of the vehicle they allowed us to get involved. Our Classic car transport truck was luckily capable of moving the now fully restored and liveried 4 tonne vehicle and we hold all the correct licences to actually perform the moves with this weight on board so over the summer we have been moving the vehicle between shows and its base storage facility. Needless to say that the truck went down a storm at the shows and all the hard work has paid off in so much that we have been recognised for the level of detail that we went to when actually restoring the car. we think it looks fantastic now with all the livery complete, what do you think?